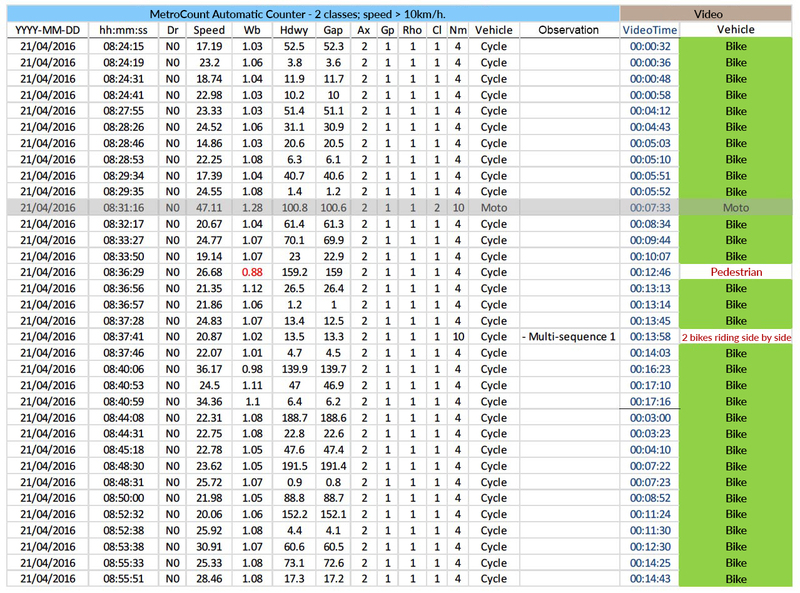 Evaluate the capacity of the counter (especially the volume of bikes) against a manual count using video equipment. The chosen bike lane is separated from the road by a chamfered kerb with a height of about 5cm. On the other side of the lane, there is a contiguous sidewalk, built at the same level. During the equipment installation, the two pneumatic tubes were fixed at 60cm apart, perpendicularly to the sidewalk and the bike lane. The advantage of the MetroCount system is the recording of individual tube hits. 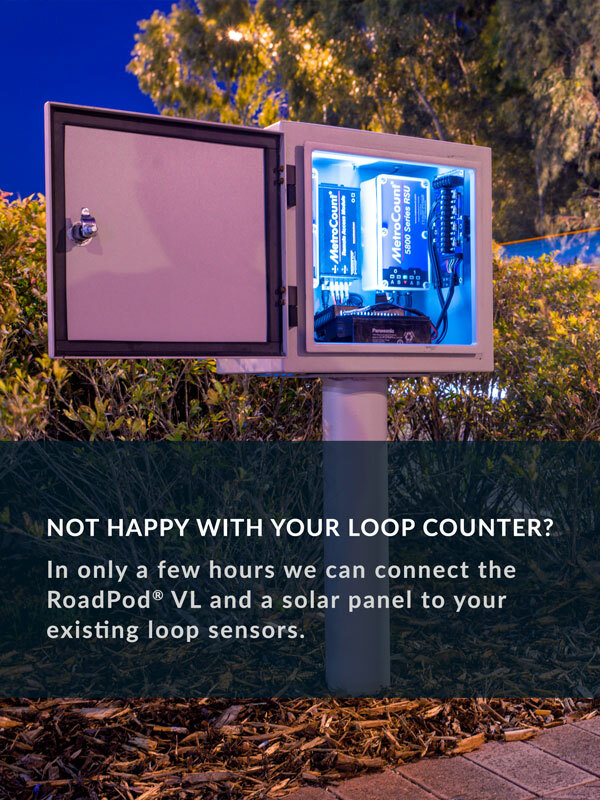 Since a bike has two wheels and the counter connects to two tubes, the system will record 4 events per bike. 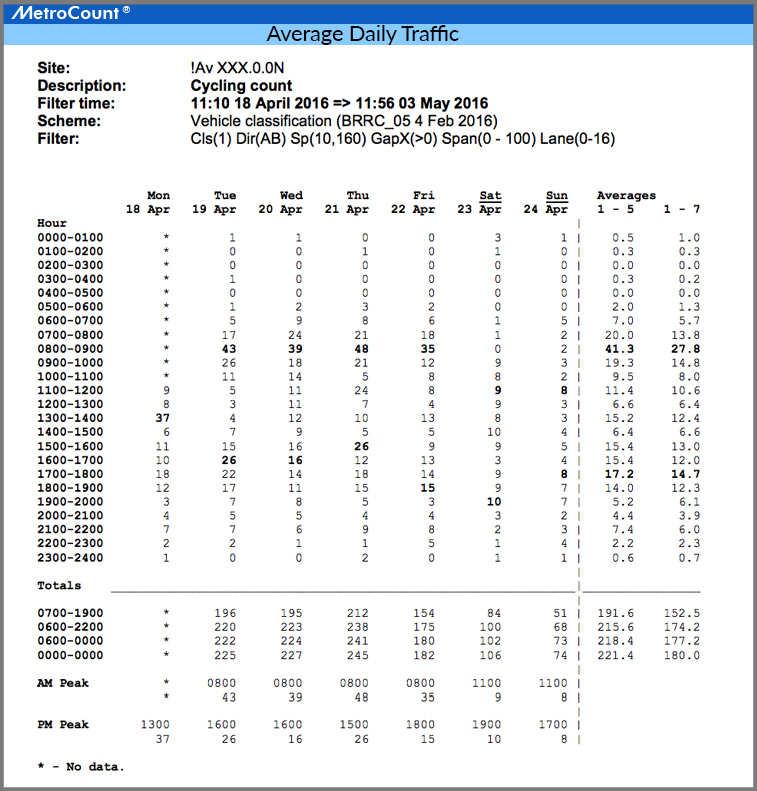 This enables detailed post-survey analysis of volume, speed, the gap between bikes, and even classification. Any vehicle with a recorded speed lower than 10km/h has been excluded from the analysed dataset, as it doesn’t represent the object of the analysis (e.g. baby pram). A 30-minute manual count using video equipment was conducted on the 21st of April. The results were compared to those provided by the counter. Overall, 32 out of 33 bikes were fully detected. The bicycle that was not recorded was part of a group of two, travelling side by side. While the MetroCount system has identified the bike cluster (see Observation: « multi-sequence »), it only logged one wheel of one bike. A careful examination of the video shows that this bike avoided the tubes by riding on the adjacent kerb. Notably, during these 30 minutes of video recording, the only motorbike that drove by was successfully identified. However, the system incorrectly identified a pedestrian which was recorded as a bike. Stricter classification rules would have avoided this error as the pedestrian was recorded at 0.88 metres and with the MetroCount software, classification can be changed post study. The data was collected from a recently inaugurated bike lane providing an opportunity to analyse how the community is using this new infrastructure. The results of the volume and speed analysis are presented below. For detailed information, please consult the official BRRC report (available only in French). The report is now also available in Dutch; please visit the following website (registration needed): http://www.brrc.be/nl/artikel/n115 and http://www.brrc.be/fr/article/f115 for the French version.